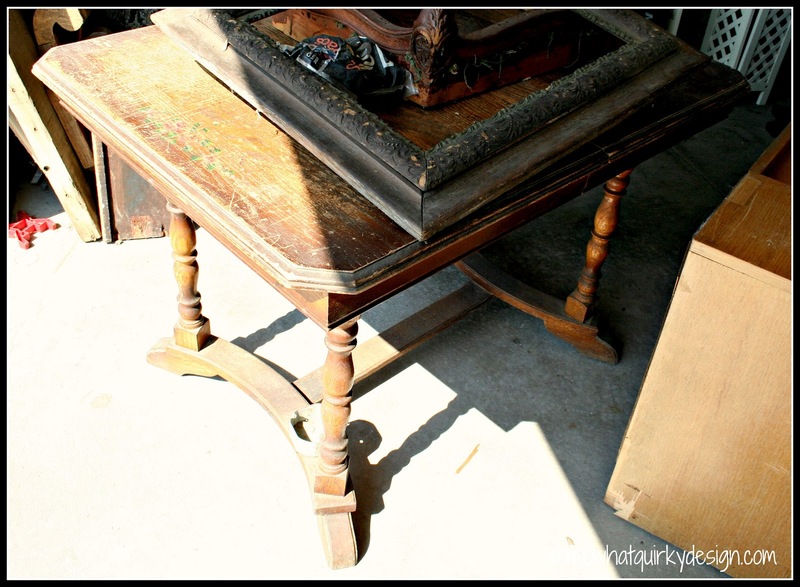 A couple of months ago I went to an estate sale put on by Artful Solutions, one of the new kids on the block for estate sales in our area. They have wonderful sales. Their pricing is basically fair and instead of haggling over prices they have a plan - full price on day 1, 20% off on day 2, and 50% off on day 3. Simple as that. Sometimes I don't even go on the first two days - just to avoid temptation. But, sometimes I go day one to scope it out and then go back on day 3 to get the deals. This particular week I went on day one because the pictures on estatesales.net were pretty enticing. During my trip through the basement I found this table. Ignore the other stuff, this is just what happens to stuff once it falls into the garage. I thought it was pretty cool for $15. So I bought it. Full price. 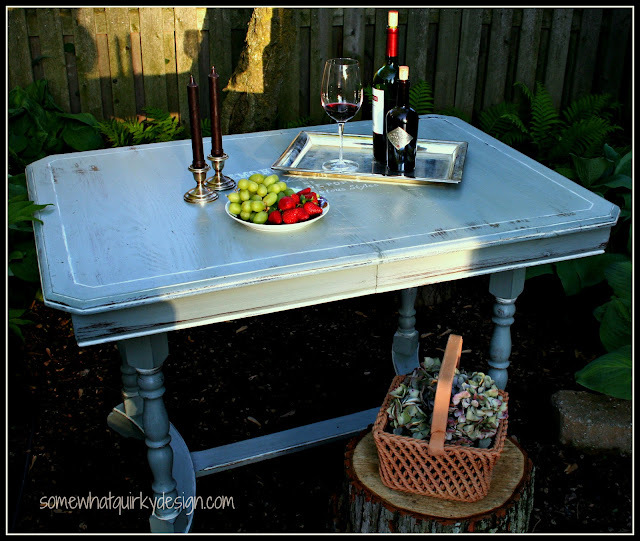 The woman who owned it was a professional dress designer/maker and she used this table for her large pressing machines (note the electrical box on the base of the before picture). I decided to use some of my CeCe Caldwell paint on this. Smokey Mountain. It is kind of blue/green/grey. Very, very pretty. 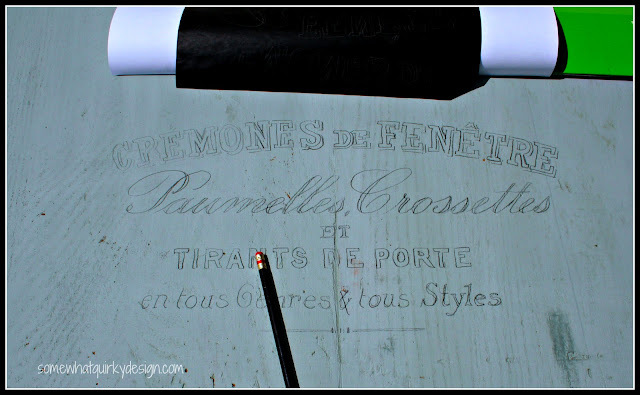 It was a little boring all solid and all so I did some highlight painting in Vintage White. I just used one coat of paint. Usually I use two, but I thought I would walk on the wild side a little and see how one coat worked. I like it OK, but if I had it to do again, I would use two. I also decided to do a little transfer onto the top. I found this on The Graphics Fairy. Thank you Graphics Fairy! 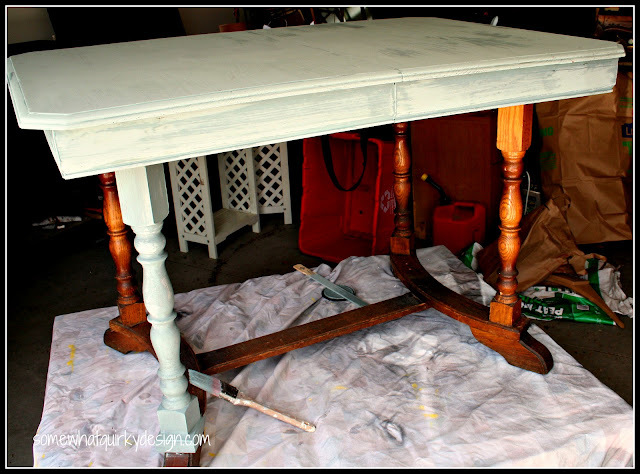 I distressed the whole table with a damp rag and then waxed everything but the top with with CeCe Caldwell clear wax. I covered the top with CeCe Caldwell Durable Satin Finish. This is a new product, designed to use on areas where you want a little more durability. 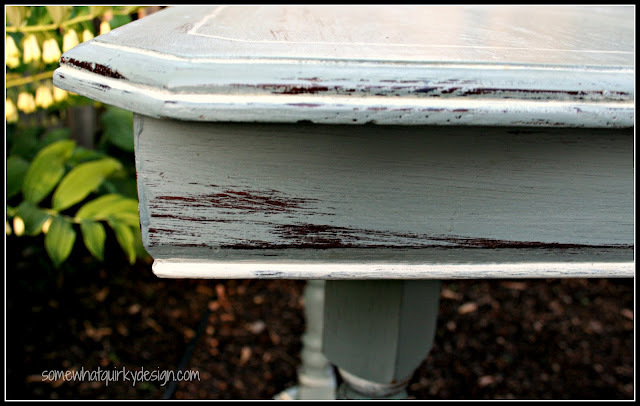 I thought since I only used one coat of paint on this and distressed the edges pretty heavily that this would be a good time to try this product. I like the curved base lines. Her legs aren't anywhere near as nice as my last table conquest, but her bottom is pretty nice! Have you tried any CeCe Caldwell paint yet? The only complaint I have is I had a hard time working on it with the Sharpie paint markers that I used for the graphic. I'll have to figure that one out later. Don't you think she's pretty? I'm going to try to sell her. In the meantime, it's back in the garage for her....what a shame. She is looking beautiful all dressed up. I have a couple colors of Caldwell paint, my almost empty favorite color is the Hershey brown. I am going to have to look into the new satin finish stuff. This piece turned out amazing!!! It would be hard to give up. Thanx for sharing at THT! Excellent job. I love the colors you used and your graphic came out great. I bet you sell her in no time. you are so talented! can i be you for a day? That table is gorgeous! I love love love what you did to it! Great Job! This is GREAT! 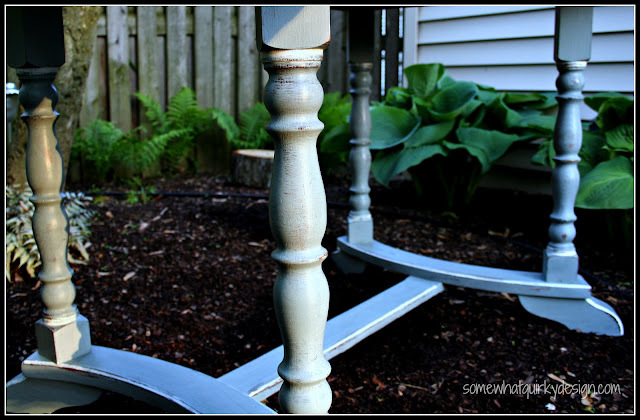 I have been using a sealer on my tables...glad CeCe now has one. it looks beautiful!!! i love that color! Beautiful little table! You did a great job making her look just perfect! Karen, this turned out SO nice! It us just beautiful! Thanks so much for sharing with us this week! This is absolutely gorgeous! Thanks so much for sharing with us at Toot Your Horn Tuesday! I featured your table on the Chronic Christian Crafter facebook page...would love it if you come grab a feature button. 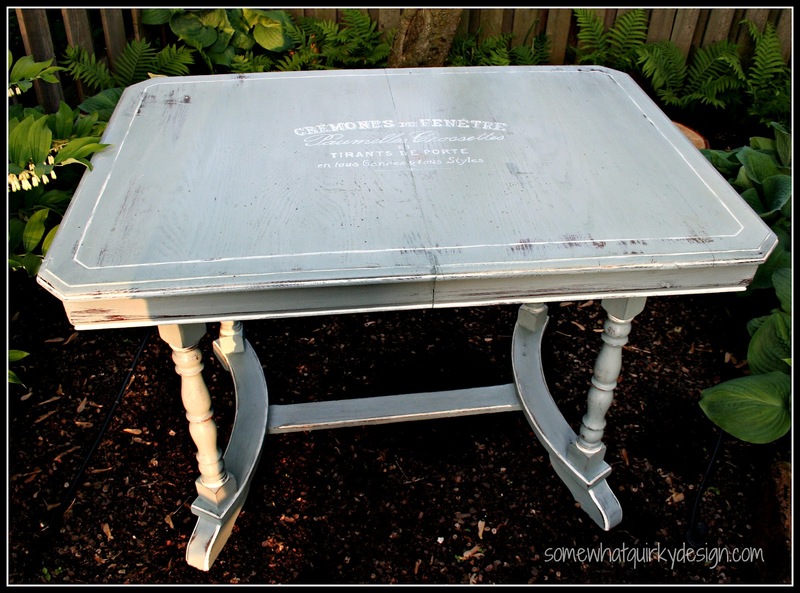 I loved what you did to your estate table find! Thanks for linking up. Hope you link up again! 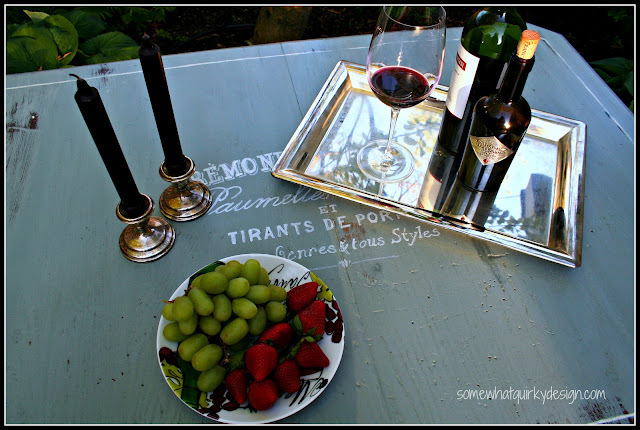 What a beautiful table...I love the shape/lines of it. Love the details and the paint treatment. This turned out beautiful! Oh, how can you put her in the garage? She is so lovely and has great legs.